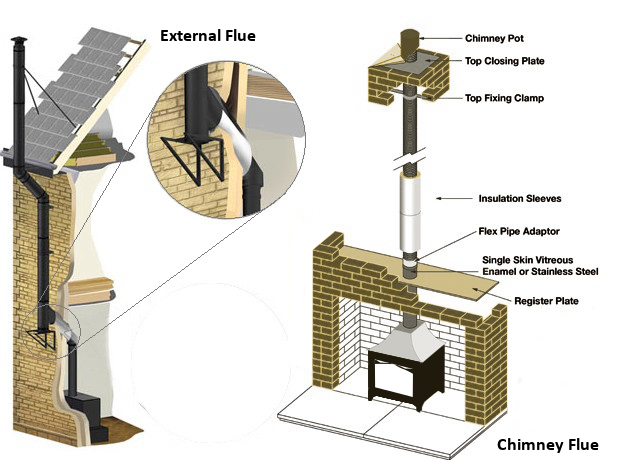 Most UK homes have chimneys in them, however when a biomass boiler or stove is fitted, it is important to note that there are fundamental differences between the combustion method of an open fire and that of a biomass boiler system or stove. Flue gasses will condensate on the brickwork in the chimney and damage the chimney. Gasses can escape creating a toxic atmosphere inside the property. Tar and deposits will form creating a fire hazard. A flue can be installed into an existing chimney in various ways; fitting a liner (concrete or clay) or by running a stainless steel (flexible) insulated tube from top to bottom. Your installer will know the optimal length required of the flue as this will affect both its efficiency and ensure its safe operation. Stainless steel (or other suitable metal) rigid flues, can also be installed without the need of a chimney. These are installed by cutting through an external wall or up through the ceiling and out through the roof. So don’t panic if your home either has no chimney or would not suit an industrial biomass boiler in the middle of your living room. Please be aware that with any device that burns fuel in your home, it is advisable to install a carbon monoxide detector. Faults with systems can unwittingly produce a highly toxic and even fatal gas, so please ensure your biomass boiler is serviced in accordance with the manufacturers recommended guidelines.